Hello everyone, hope you are all well! I thought i’d do another review of these Lee Stafford hair products that I am currently using on my hair as I love what they do especially as I have ombre hair they really help and flaunt the blonde in my hair if you will. For those of you who don’t know, Lee Stafford is a british hair dresser and hair stylist who also has a very successful hair care range which you can pick up at most Boots stores with products tailored for all hair types from blondes to brunettes and curly to straight. Both of these products that i’ll be reviewing are both from within the ‘Pink Range’ and I literally don’t know what I would without both of these products. Anyway onto the reviews! I bought this a while back when Boots had a 3 for 2 offer on all Lee Stafford hair products and I picked this up along with my Bleach Blondes Shampoo and Conditioner which I have featured multiple times on my blog. It is designed to give your hair a tousled textured look that you get when you’ve been swimming in the sea whilst still keeping your hair feeling and looking soft and shiny. For me I can totally agree that this product does exactly what it says on the bottle! I apply this normally when my hair is still damp and then leave it to dry naturally as this helps to give my hair a nice loose beach wave kind of look that also leaves my hair smelling so so nice and has a really nice textured feel/look to it. I also sometimes use this after putting waves through my hair to add some bounce and texture in order to set my hair. I do find that I can’t use this everyday as with my hair being bleached at the ends it does make the damage very visible and makes my hair feel more damaged as salt does dry out your hair, but other than that I love this product and if you are looking for something that can create subtle waves then this is for you! This product I have featured on my blog before but I only did a little review on it, so I thought i’d still include this but talk a little more about it. I picked this up at the clothes show along with another set of the Bleach Blondes Shampoo and Conditioner and is a part of the Bleach Blondes range within the ‘pink range’. This product is designed to permanently lighten the colour of your hair over a slower period as it technically is bleaching your hair meaning it will cause some sort of damage but is directed to be used 3-4 times a week instead of on a daily basis so the damage is kept to a minimum. You can use this all over your hair to highlight or like me you can use it to maintain your bleach blonde and keep it looking fresh. I have been using this on and off since I purchased it and I have recently started using it again as I have recently redone my roots which has faded the higher parts of my ombre. I spray this on the ombre part of my hair whilst it is still damp after washing every other day and normally after about 2-3 weeks I can start to notice that the ombre part is looking a lot lighter. Even some people ask me if I have rebleached it, which is nice that other people notice it too. I really like this product because it helps me to maintain the blonde in my hair without rebleaching it which for me is amazing because as all of you know my hair is very damaged and I will do anything to not cause it a load of more damage. If you are looking for a product to help maintain your blonde, ombre your hair or even touch up your roots between bleaching then this product is definitely something you should try. 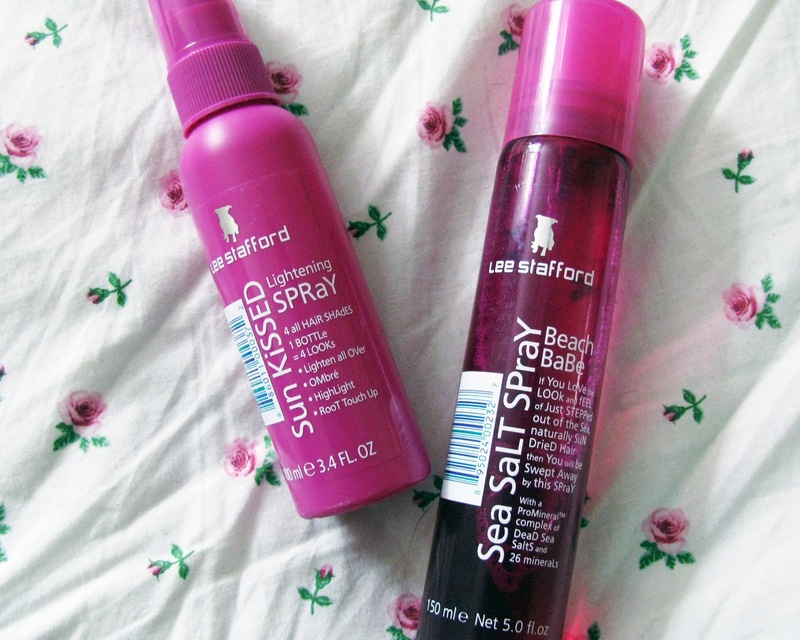 Have you tried either of these products from the Lee Stafford Hair Care range?